After eating entirely too much soup for the past few weeks, I was craving some solid, weather-appropriate food. 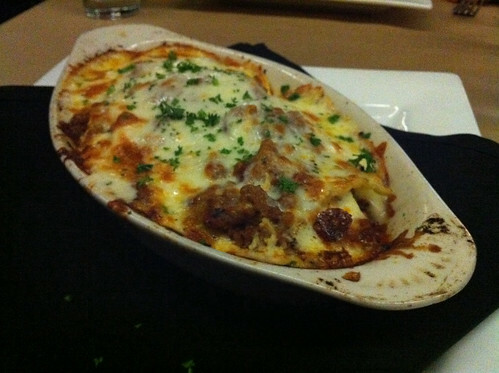 I wound up at Spindini, the Grisanti-owned Italian restaurant on South Main. I started with the Tuscan Butter appetizer. 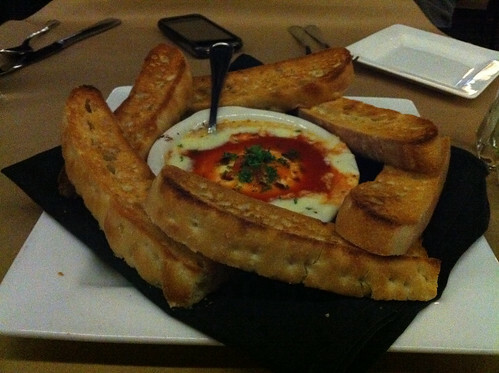 It’s a bowl of warm, almost-liquid mascarpone cheese and red sauce served with chunks of focaccia bread for dipping. It’s really good, but exercise some discipline – it’s entirely too easy to fill up on the butter before dinner. If you can’t tell from the photo, that’s a seven inch long casserole dish filled with sausage and beef lasagna. It was warm and filling, perfect for the cold night. That said, I wish that Spindini had a vegetarian version on the menu – there was a ton of meat, which made it a little too dense for my liking. Spindini had the distinction of placing first in the “Best Cougar Bar” category in the Memphis Flyer’s annual reader’s poll this year. When I was there (around 7 p.m. on Monday), I didn’t notice any ladies of a certain age on the prowl, but the crowd was decidedly middle aged. The space is dark and sleek. The vibe is trendy and upscale – despite having the Grizzlies game on TV, the bar is more martinis than beer. Price-wise, it’s a bit of a splurge, with most entrees are around $20 each.